Are you ready for days to be longer? (Note: I did NOT say work days!) I am! Although I don't like losing an hour of sleep when moving my clock forward, I do love that the sun sets later and later...and that summer is coming! So don't forget, and don't be late! 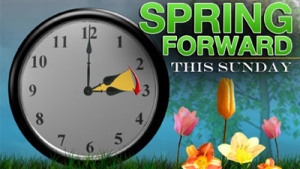 Change your clocks 1 hour ahead before you go to bed this Saturday night...and don't forget to change lights that are on automatic timers, too!